By the addition of an innovative direct injection biomass boiler fuelling system from Alstom Power, one of the UK’s largest coal fired power stations has increased biomass co-firing from the previous 10% to greater than 20%, more that doubling its carbon reduction on two of the four units at the station. Initially the system will utilise palm kernel chips although other vegetable by-products such as olive kernels or wood pellets can be accommodated in the design. Whereas previous, more traditional systems have relied upon the use of a pre-combustion system utilising primary, secondary and flue gas return fan systems, Alstom has simplified the process by blowing the milled biomass fuel directly into the boiler utilising high pressure forced draft fans. The two boilers at the power station have split furnaces and in opposing corners of the 4 sections, the 8 fans inject biomass fuel. An additional elevation within the boiler by the utilisation of an existing air input means that the milled biomass is blown in between two of the vertically aligned coal inputs and thus is burned separately from the coal. This technique has made a significant improvement to the efficiency in combusting the biomass fuel component. For this project Alstom selected 8 custom designed FD fans from Halifax Fan of Brighouse. Their decision was supported by performance guarantees based upon Alstom witnessing a model performance test of what was in essence a new fan designed specifically for this project. The design was based upon a No53 narrow width backward curved high pressure fan of 53ins diameter. These are driven by 280kW 2pole motors via flex couplings, through dedicated fan cartridge bearings of Halifax’s own design. These bearings offer a high end thrust capability and proven reliability. 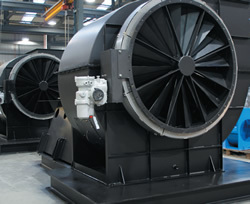 The fan casings were designed for 0.4 bar g operating pressures and 3.5 bar g containment, were equipped with full condition monitoring, inlet vane flow control, inlet silencers and acoustic case protection and were designed to meet ATEX group II certification, cat 2D T1250C internal and group 3D T1250C external. This fan model has now been adopted into the Halifax Fan product portfolio. In addition to model testing to BS848 part1, Halifax also conducted full BS848 part 1 testing of a completed unit to strict tolerances and then conducted full mechanical run testing of the other 7 units, all in-house. Halifax project managed this fan solution contract in its entirety from initial quote to despatch, installation supervision and commissioning on time and to budget.